Knitting Needles For Beginners: How to Choose the Right Type! Choosing the right tools for the job can often be the deciding factor in either your success or failure, especially when you’re new to something. Picking the right knitting needles for beginners doesn’t have to be difficult though. If you understand what it is you need to make, and what type of yarn you’ll be working with, it can become a lot easier to narrow down what you need to complete the job. Using the right knitting needles for a project can also make a huge difference in determining the quality of your finished product. Using needles that are too big will result in your item being too large while needles that are too small will instead make it tight. And as you will learn as you get deeper into the world of knitting- gauge is EXTREMELY important. 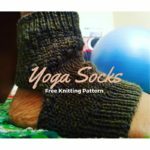 Since certain yarns will either be easier or more to difficult to knit up depending on the material type of the knitting needles you use, assessing your yarn will also be instrumental in succeeding. Knitting needles come in a variety of different shapes, sizes, and textures. 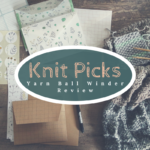 There are three major material types that knitting needles come in, and below I will go into a little more detail about them and their pros and cons. Plastic needles, particularly straight ones, are generally the most used knitting needles for beginners. This is because they are easily the most inexpensive of all types. 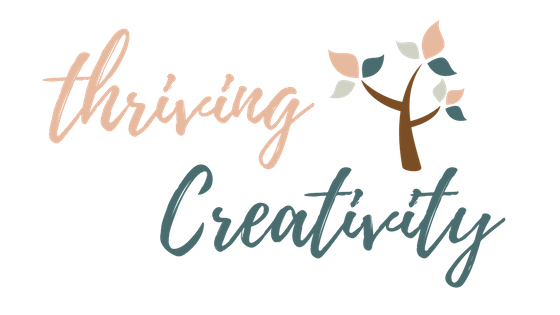 It doesn’t require that much of an investment to get started, and gives you a chance to try this fun little hobby without breaking the bank. While they are very affordable, they aren’t too durable. I found this out when I accidentally sat on my first pair. They are lightweight and very portable but probably my least favorite type of needles now that I’m a bit more advanced. I just don’t really like the feel of them, but remember, that’s personal preference. Nevertheless, I think they can be a great first step for introducing yourself to the wonderful world of knitting. Metal or aluminum needles are probably the second most popular material type. This is because they are slick, making it easier for the yarn to slide across the needles. While this is helpful for someone just starting, as it makes it easy for you to get a nice steady flow going, it can get a little tricky if you try and go too fast. Since the yarn will move more easily across the needles, stitches are more likely to slide off the tip of the needle if you aren’t careful. This can be avoided if you go slow, which is pretty much a given for a beginner anyway. Another big reason that aluminum needles are great for beginners is because they are generally not too pricey. To add to this they are also very sturdy and probably the hardest type to break in relation to the other material types. My first set of needles were a pair of straight aluminum needles and I still have them to this day! Wooden needles are definitely my preferred choice for knitting. Usually when people think of wooden needles, their mind automatically shifts to bamboo because they are probably the most popular type, but I don’t think they’re the best. I said that aluminum needles can be a bit tricky because they’re slick and yarn will slide easily on it. Well bamboo is the opposite, and with the yarn clinging a little more tightly this can negatively affect tension. For this reason I probably wouldn’t recommend bamboo knitting needles for a beginner. I would however suggest a different type of wooden needle. I’ve found my favorite pair of knitting needles and they’re from a company called Knit Picks. They have a variety of needle types- straight, circular, and double-pointed which I’ll dive into more detail about below- in a wonderful material, Caspian Wood. They are wooden but slicker than bamboo, but not quite as slick as aluminum, making them the perfect medium for me. They are a bit pricier but if you decide knitting is something you seriously want to continue with, it’s a great investment. (They even have a handy “Try It” set that is relatively inexpensive if you’d like to see how you feel about it. It comes with one Caspian Wood and one Nickel Plated. I’ve linked it below.). Above I have listed the different materials that knitting needles generally consist of. We also have to think about the different shapes and sizes needles come in as well. In the US needle sizes start at 0 (2mm) and go up to a size 19 (15mm), generally going up about .25mm for every size increase. I’m including a chart below with the sizes in both US and UK so you can get an idea of how things go. Generally smaller needles are used with lighter weight yearn, and larger needles with thicker yarn. 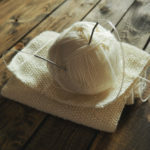 Straight needles are mainly used when knitting things flat- like washcloths or scarves- but can be used to knit things that are normally knit in the round such as hats or socks. This requires you to seam up edges though which can sometimes give the item a bulkier look and feel. 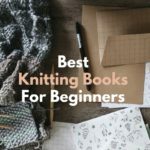 They are however better for grasping the basics of how to work yarn, hold needles, and differentiate stitches, making them ideal for a beginner. Circular knitting needles can be great once you grasp the basics of knitting. In fact majority of my knitting friends prefer circular knitting needles to any other type. As their name suggests, they allow you to knit things circularly, with two needles attached by a cord. This means the work is connected, making it great for things like hats or certain garments (shirts, socks, sweaters), giving them an almost invisible seam. With enough practice you can even begin knitting flat items in the round. Double-pointed needles, like circular needles, are for knitting things in the round. Since the needles are pretty short, they’re best for smaller things on the round. 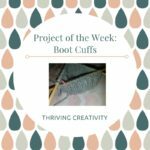 Often times you can start a pattern with circular needles but as the number of stitches decrease it’s necessary to switch to DPN’s to finish out the project. Generally you use anywhere from 3-5 needles at a time with the total amount of stitches divided almost equally among the different needles. 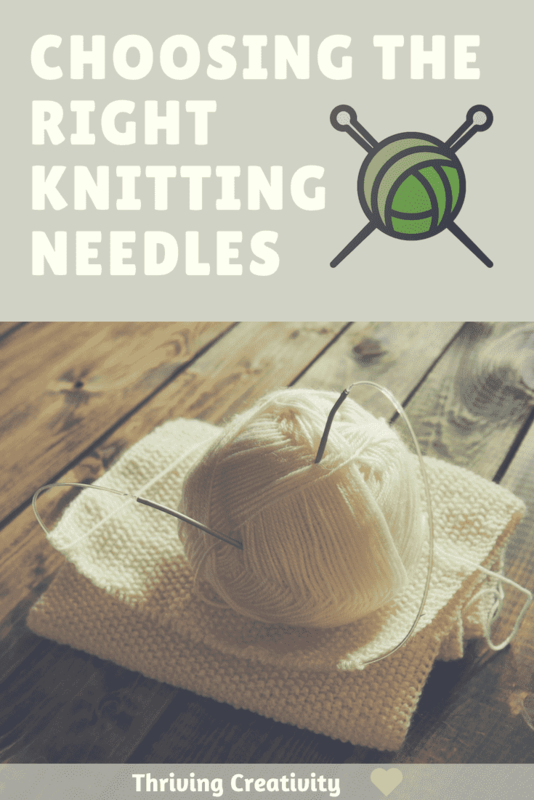 It can get tricky juggling so many needles, and can be a little easier to drop stitches. I definitely wouldn’t recommend these to a first time knitter but use them myself frequently. Interchangeable knitting needles are essentially sets of circular needles with removable tips so that you can use the same cords, just switching out the needle tip sizes as needed. The main difference with these and circular needles is that some circular needles come in just one piece with no removable tips. With a complete set of tips and a few cords you can pretty much have any combination of needle size and length you need! And many beginners often find it easier to work with circular needles because of how easy the yarn moves, and the lack of laddering that you can often get with DPN’s. These are actually relatively new to the knitting world. As I stated above, some people can have trouble with DPN’s, and the Flexi Flips by Addi is a nice solution. It’s a mix between DPN’s and circular needles, making the struggle of balance so many different needles a bit easier. They also help to prevent laddering, a common issue that occurs when using double-pointed needles. I wouldn’t say they are ideal for a total beginner, but for someone looking to try out DPN’s, I think they’d make a good fit. Overall it’s hard to give a definitive answer on what works best as everyone is different. 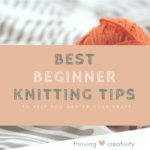 But I’d say my biggest tip to choosing the right knitting needles for beginners is to first get inexpensive material types metal or plastic so you can figure out how you like the craft before investing too much. Next go for straight- they’re what most beginners work with, you can find tons of easier patterns for them, and it’s simpler to get used to the techniques and see how your work is coming along. In the round you may confuse yourself at first. In the end, just feel it out and eventually you’ll find your way!